For other uses, see Peach (disambiguation). The peach is a species of the Prunus persica, and is a fruit tree of the rose family Rosaceae. They grow in the warm regions of both the northern and southern hemispheres. Peach blossoms are small to medium-sized. The tree is sometimes up to 6.5 m (21 feet) in height. When it is grown by people, the height it is usually kept between 3 and 4 m (10 and 13 feet) by pruning. Its leaves are green and pointy. They usually have glands that make a liquid to attract insects. Peaches are also called stone fruits because they have a shell of hard wood around their seed, called a stone or a pit. The skin of a peach is an orange or yellow color, and it is covered in small hairs called peach fuzz. A peach without the fuzz is usually called a nectarine. The inside of a peach is a golden color. It tastes sweet and sticky. Because of this, peaches are often part of desserts. The peach first came from China. It has been grown from at least since 1000 B.C.E. In Chinese culture, the peach tree is considered to be the tree of life and peaches are symbols of immortality. Peach blossoms are carried by Chinese brides. Because of the cold winter, diseases, and pests, peach trees can usually only live about 10 to 12 years. However, if a peach tree is fertilized properly, and taken care of in the right way, it may live more years. 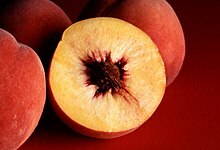 Brown rot is a very dangerous kind of peach disease. It can attack the blossoms and stop the fruit from developing. If it is not stopped quickly, good quality fruit can not be produced from the peach tree. Peach leaf curl, which is another very serious disease, makes the leaves curl up and begin to die in spring. It can be stopped if it meets fungicide. Bacterial spot gives harm to the leaves, twigs and fruit. By the time the disease is recognized, it is often too late to stop it. However, some kind of sprays may be used early in the next season to protect the peach tree. Cankers is a kind of disease that infects the twigs and branches. They make large amounts of amber-colored gum spill out from the infected branch. Later, the bark will crack open completely and the tissue of the twig turns black. Cankers can be removed by pruning. There are several kinds of insect pests that can be great trouble to the peach. The Oriental fruit moth can make the peaches filled with worms and young growing tips may die. The plum curculio lays its eggs on the fruit, and makes them drop off or become filled with worms. Insects like the tarnished plant bug and the stink bug eat up the fruit that is still developing. Borers attack the base of the trunk and the branches. Wikispecies has information on: Prunus persica. ↑ "IPNI Plant Name Query Results". ipni.org. Archived from the original on 25 September 2015. 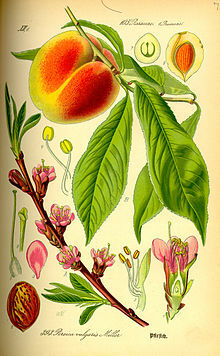 ↑ 3.0 3.1 3.2 3.3 "Peach Facts: All about Peaches | The Nibble Gourmet Food Magazine". thenibble.com. Retrieved 13 July 2011. ↑ 4.0 4.1 4.2 4.3 4.4 4.5 4.6 4.7 "G6030 Home Fruit Production: Peach and Nectarine Culture, University of Missouri Extension". extension.missouri.edu. Retrieved 24 April 2010. This page was last changed on 7 January 2019, at 11:00.